So, as I’ve said before, soup is one of my favourite Weight Watchers lunches. You can have a big bowl of it with a slice or two of bread for a low SmartPoint and very filling lunch. What a result 😃 a 1 SmartPoint lunch! And it has kept me going for hours! If, like me, you enjoy soup as an appetiser, as a low SmartPoint lunch or just as a mid afternoon snack, you may be interested in this Pea Soup ,this Carrot & Coriander Soup or perhaps this Tomato Soup. If you like your soups spicy, you may be interested in this Tom Yum Soup. Chop the onion finely (pic 1) before using the saute setting and cooking until it has turned translucent and has started to brown (pic 2). After you have sauteed the onions, you can add a tablespoon of water to the pan to de-glaze it. Use a wooden spoon to scrape off any browned bits of onion from the bottom of the pan. This will add to the flavour of the soup and will prevent it from continuing to cook and burn to the bottom of the pan. Add the garlic, spices and curry paste to the onions and cook for a further minute (pic 3). The paste will start to smell wonderfully aromatic and then you can add the stock! Secure the lid of your Instant Pot and seal the vent. Set to high pressure and cook for 5 minutes (pic 5). Once done you can use quick release to discharge the pressure or you can leave it to naturally release. The butternut squash will be soft and tender (pic 6). Garnish the soup with toppings of your choice – or eat just as is! Saute the onions until they have turned translucent and have started to turn golden brown. As this recipe uses only 1 tablespoon of oil, you may find that the onion starts to stick to the bottom of the pan. Once you have finished cooking the onions, add a tablespoon of water to the pan and use a wooden spoon to scrape off any browned bits from the bottom of the pan. This adds to the flavour of the soup and also prevents them cooking any further and burning to the bottom of the pan. 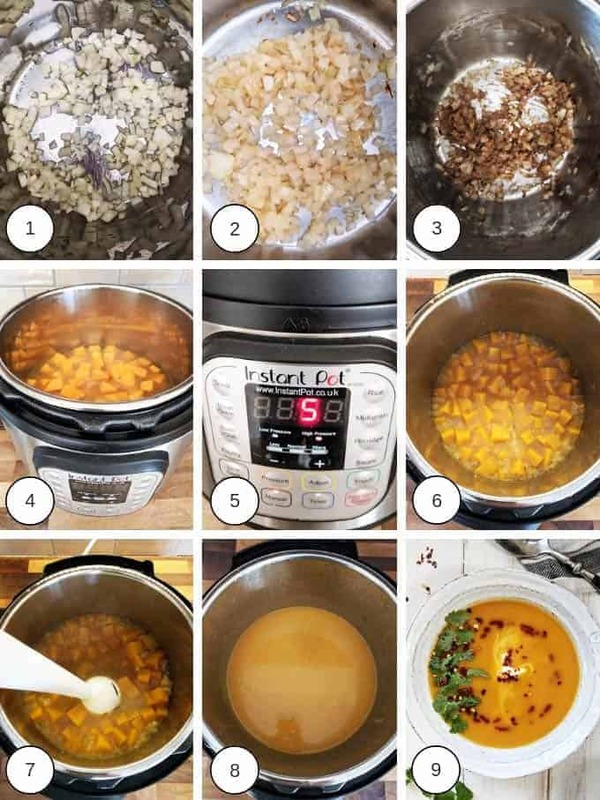 Although I have suggested simmering the butternut squash for 15 – 20 minutes, it all depends on the size of the chunks you are using and whether you are using fresh or frozen butternut squash. I would therefore suggest that you check the squash after 10 minutes by prodding with a fork. If the fork pierces the butternut squash easily you can remove from the heat. If the squash is still firm then cook until tender. 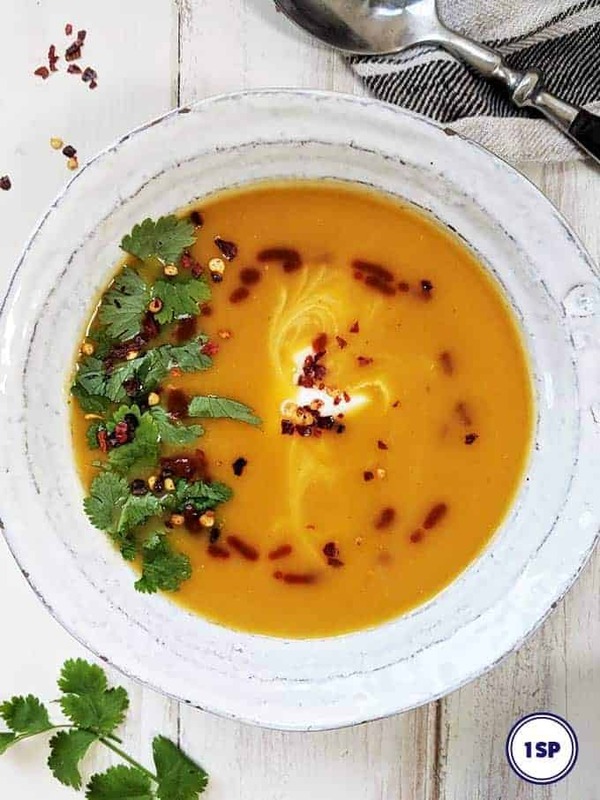 The soup is delicious served just as it is or you could also serve it with a garnish of coriander / cilantro leave and a sprinkling of red chili flakes. 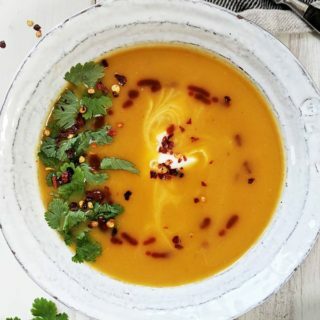 I also like to swirl a little bit of fat free natural yogurt through this soup for added creaminess and a drizzle of hot chili sauce for an added kick. 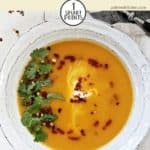 I used my Instant Pot to make this soup. Various different models and sizes of Instant Pot can be found on Amazon. I love Sriracha Hot Chili Sauce, available from Amazon, drizzled over this soup. Beware though, it’s hot! I use an immersion blender, like this one available from Amazon to blend the soup till it is silky smooth! 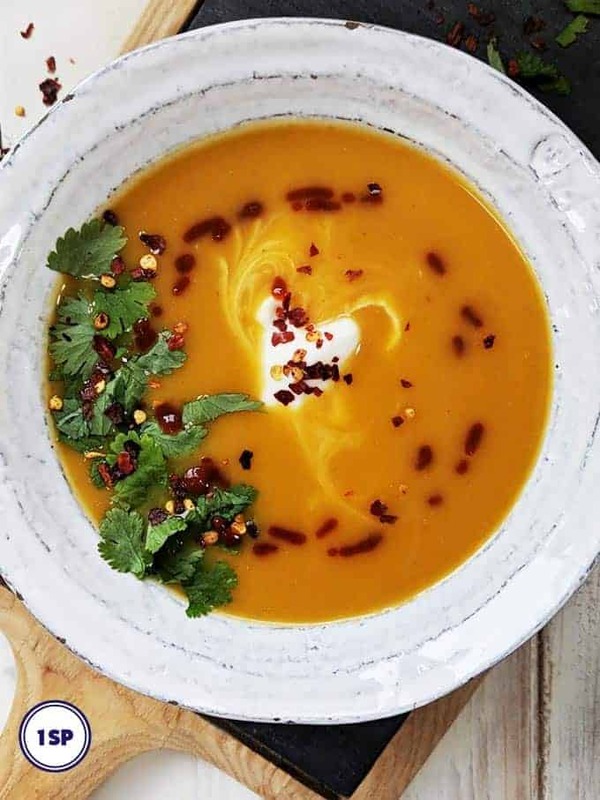 This spicy butternut squash soup is just 1 SmartPoint per serving on Weight Watchers Freestyle / Flex plans. Turn your Instant Pot to saute & heat the oil. Add the chopped onions and saute. stirring continuously, until they have turned translucent and have started to brown. Add 1 tablespoon of water to the bottom of the pan & de-glaze. Add the chopped garlic and saute for 30 seconds before adding the coriander, cumin, salt and curry paste. Stir and cook for a further 30 seconds to 1 minute until the mix starts to smell fragrant. Add the stock and stir before adding the chopped butternut squash. Secure the lid on the Instant Pot and seal the vent. Cook on high pressure for 5 minutes. Once the Instant Pot has beeped so say it has finished you can quick release the pressure (or naturally release if you're not in a hurry!). Uncover, switch off the Instant Pot and use an immersion blender to blend the soup. Serve hot with a mixture of natural fat free natural yogurt, chopped coriander / cilantro, chili flakes and sriracha sauce. Heat the oil in a large saucepan. Once the oil is hot, add the onions and saute for 6 - 8 minutes until they have turned translucent and started to brown. Add 1 tablespoon of water to the bottom of the pan to de-glaze it. Add the chopped garlic and saute for 30 seconds before adding the coriander, cumin, salt and curry paste. Stir and cook for a further 30 seconds or so. Add the stock and butternut squash and bring to the boil. Once the stock has started to boil, reduce the heat to a simmer and cook for 15 - 20 minutes until the squash is soft. Remove from the heat and use an immersion blender to blend the soup.